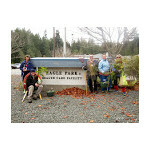 Eagle Park Auxiliary hasn't added a story. The Eagle Park Auxiliary was founded to improve the lives of residents of Eagle Park Health Care Facility. Seventy residents live at Eagle Park, and most of them are in the later years of their life. Many studies have shown that an attractive view from a patient's window has improved the health and well being of patients. Some of the residents at Eagle Park are able to wheel themselves around the garden to enjoy the gardens and others will be looking out the window, but either way they deserve a wonderful, uplifting view. It is also important that the staff have an attractive workplace, as care giving for the sick and elderly is a demanding job. The gardens at Eagle Park have been built and maintained by the Auxiliary for over twenty years, but now are in need of some updating and renovation. We have a group of ten volunteers who are willing and able to work but need some professional Horticultural Guidance to really manage the gardens well. The irrigation system is in need of repair. We need topsoil and plants to fill in areas where plants have died or are overgrown and need removal. We have done a myriad of fundraisers, including flea markets, bake sales, plant sales, and have kept the gardens going, but we are now reaching a crunch where our expenses exceed how much we have been able to make, and we would like to keep our Horticulturalist employed. This is a part time position, but the Horticulturalist provides guidance and organization for the group, and maintains the overall garden flow of activities while volunteers come and go. We have a team of people who are applying for grant money to keep the garden going, but it is a time consuming process, and we would like to be able to start planning our spring garden. We are hoping that the community recognizes the imprtance of providing the seniors and some of the younger patients at Eagle Park with dignified and pleasant surroundings, with an ever changing flow of color and beauty year round. After all, we are all headed into our older years at one time of another, and would appreciate the same being done for us. Thank you for your help. Eagle Park Auxiliary hasn't posted any updates yet. Eagle Park Auxiliary is managing the funds for this campaign.